There have been some exciting updates that have happened around the house here in Casa de Murphy this summer! One of the most exciting that I want to share with you today is that we upgraded Mr. Liam’s room from his nursery decor to a full-on big boy room. With the exception of converting his crib to a toddler bed back in June 2013, his room has been the same Disney Lion King theme since we 1st were getting ready for his arrival. I have to tell you that I had mixed emotions for this experience — sad to see the last of his baby things go out of his room but yet excited to watch & help him pick out his own furnishings. Here’s a peak at what his room looked like before we began the update……. Liam’s room is much smaller that we originally thought while 1st shopping for new beds. The placement of the door, window & closet also proved to make things a bit challenging. There were several beds we chose that ended up being too big or awkward of a fit when we measured to fit. We knew that we didn’t want to go through re-doing his room all over anytime soon, so we wanted a good, solid bed that would last awhile. We decided to go with bunk beds & opted for a twin over full. This particular one is a definite space-saver, as the left-hand side also have a set of SIX FULL drawers and FOUR cubbies to store toys, books, etc.! No need to buy an extra dresser for us. LOVE IT! If you’re in need of kids furniture & you’re in Florida, we highly recommend Kids Furniture Warehouse — great quality & awesome prices! Grammy & Papa Rock gave us these awesome pictures above of Hulk & Captain America (hung above the top bunk), as well as a signed poster from the Incredible Hulk movie 🙂 …all GREAT additions to the room!! Best of all, it was re-purposing items they already had. Gotta love that! The bookshelf is from Target, but was in his room previously …we just kept & reused it. Stephen found these art deco posters at Target and we framed them. I really love how the Marvel & DC one turned out on the blue wall. I’ve seen many people post about these 3D wall art nightlights. We got one for Liam’s Avenger’s room. Target carries quite a few different variety’s, so little man got to pick out which one he wanted. Despite the Hulk being his fav, he actually chose the Iron Man hand. It really does look cool!! My “big” project for the room was painting letters for his name and adding Mod Podge to comic book pages to put on the letters. I picked up the letters at Target (can you tell yet I LOVE me some Target 😉 ) and some red craft paint — all of it came from their new DIY section …if you’re crafty or even a wanna-a-be, like me, it’s a pretty cool section. Overall, I am pretty pleased with how the letters turned out! 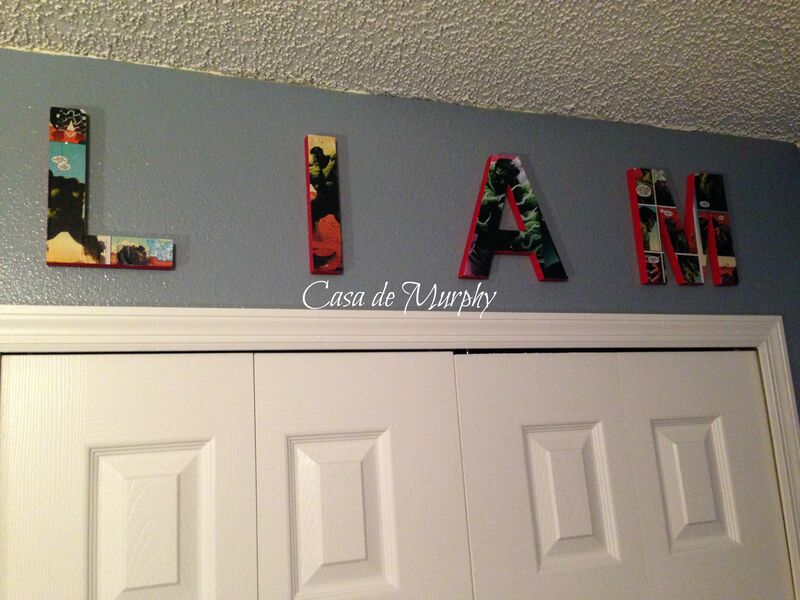 Liam’s room makeover was a lot of work (mostly for Daddy who did a FAB job), but it was SO MUCH FUN! The best part is that Liam is totally in love with it — total win!! Totally awesome post….and Grammy had so much fun running up the bunk bed with Liam! It really turned out perfect for him!